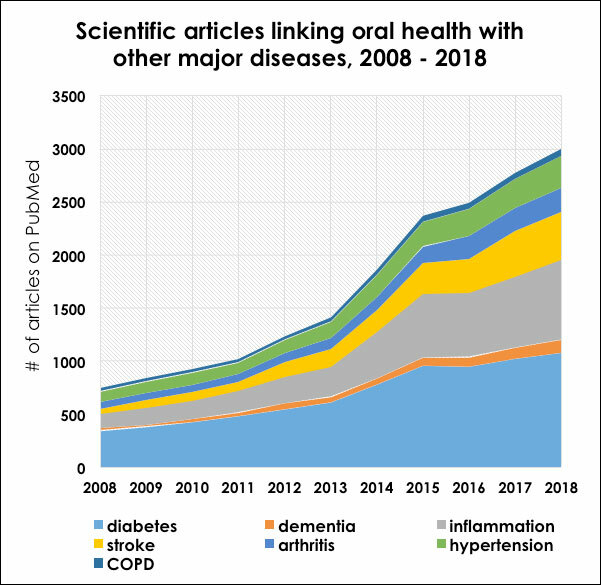 The linkages between oral health and overall health are growing stronger (see chart). Most recently, science has ventured beyond simply correlating oral diseases with other chronic and acute diseases, to demonstrating better oral health can improve overall health. There are now several intervention studies in Type 2 diabetes, for example, whereby improved periodontal health leads to better management of glycated hemoglobin (A1C). For years, Canadian dental professionals have shown that Prevora manages both dental decay and periodontal disease simultaneously. CHX has designed controlled Phase III studies to demonstrate this first multiple use for Prevora in high risk periodontal adults and will be implementing these studies in the near future. Moreover, CHX believes there other uses for this broad spectrum, long-lasting, topical antiseptic in chronic disease management. The company will be evaluating Prevora’s impact on inflammation C reactive protein (CRP) and diabetes (A1C) in its Phase III clinical program. And we are looking to partner with other organizations to evaluate how better oral health with Prevora, can lead to better overall health.